La Mesa Beautiful may have been founded more than 40 years ago, but organization secretary and board member Linda Johnson admits that many La Mesans continue to be unfamiliar with who they are and what they do. On Oct. 12, the organization hosted its annual awards luncheon; this year’s honorees included single and multi-family residences, businesses and public facilities that were recognized for landscape design and color, along with those that incorporated design and color with low water use. Jeff and Julie Jones, Richard and Joann Cando, Ben and Meg Travis and Joe and Linda Morse were among this year’s single-family residence annual awards recipients. Johnson said the annual awards are preceded by the La Mesa Beautiful Spirit Awards, which take place each July. Spirit Award winners are selected each spring after the rainy season and they’re identified by La Mesa Beautiful volunteers who feel the landscapes are among the most beautiful in the city. Each of this year’s 12 Spirit Award winners received “Beautiful Landscape” signs to place in their yards, and of those honorees, four advanced to the annual awards ceremony. Identifying Spirit Award nominees is a huge task, Johnson said, adding that not only do volunteers need to go out and photograph all the residences, they need to figure out who lives there. 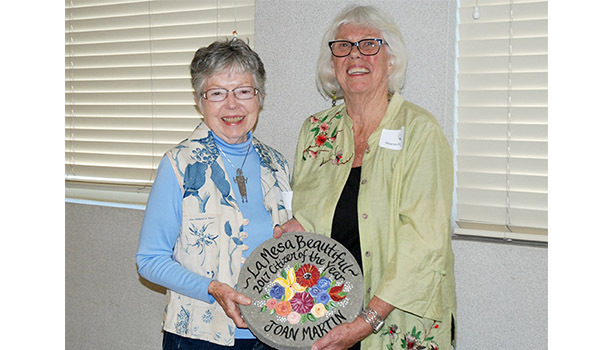 Those who find they’ve been selected to advance to the annual awards are equally excited, she said, adding that in addition to honoring homeowners for their landscapes, La Mesa Beautiful also named Joan Martin as their Citizen of the Year. Martin is a dedicated volunteer for both La Mesa Beautiful and the Master Gardner Association of San Diego County. In total, she’s logged more than 3,000 hours of volunteerism between the two. 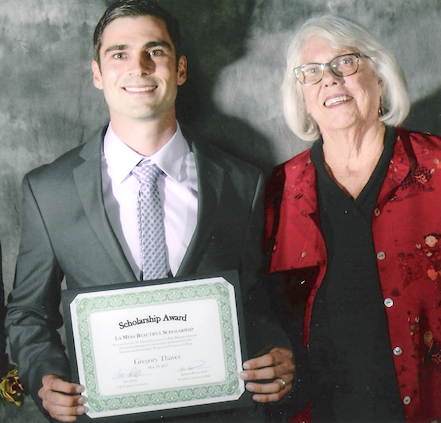 “We also presented a $1,000 scholarship award to Gregory Thayer, who is part of the horticultural program at Cuyamaca College,” she said. Scholarship winners are selected each year by representatives at their school. The 2017 awards season may be over, but Johnson said that anyone who is interested in joining La Mesa Beautiful is encouraged to do so. There are always opportunities to volunteer. For more information on La Mesa Beautiful, visit lamesabeautiful.org.